Growing Sweetcorn. How to Grow sweet corn with Tips, Pest & Disease Control. Growing sweet corn in your garden gives you that delicious buttery, salt and peppery taste that only freshly picked organic sweet corn can give. Messy with butter, sassy with flavour, steam it 5 minutes — that's the way I like it anyway! Whether you eat sweet corn raw, messy, on or off the kernel... growing sweet corn with the following advice will be easy for you. Sweet Corn is an annual, planted in spring after the last frost. Depending on the variety grown, expect to harvest 60-100 days later. The best sweet corn is delicate and sweet. You don't want to chew bland cardboard, which is the problem that occurs with much of the sweet corn that's been stored and sold in shops. Why. . .?
. . . Because sweet corns are at their sweetest just after they're picked. The height of their natural sweetness lasts for approximately an hour and then the sugar starts converting to starch. That's why home grown cobs are usually the best you'll ever eat. That is why you're here isn't it? As a sweet corn lover you know it's a good idea to be growing sweet corn at home. It's definitely worth the effort because you can pick it and eat it within a few minutes if you choose. Sweet corn can grow in many soil types, but for the best results have enough moisture and plenty of compost and humus. The best soil for planting sweet corn is slightly acidic with a pH range of 5.8 to 7.0. Ideally the soil temperature for germination should be above 10°C (50°F). For different types this temperature varies slightly. For example, super sweet or improved super sweet types of sweet corn need an optimal soil temperature of at least 15°C (60°F) otherwise under cooler soil conditions the germination process is significantly slower. This makes soil temperature a vital element when planning plantings. Simply put, this difference in soil temperature determines how long it takes for the sweet corn to emerge. If the soil temperature is about 21°C (70°F) then it takes only 5 days. But if the soil temperature is just 10°C (50°F) then it takes about 14 days. Before planting, your soil should be fertile and had dried out at some stage. This helps in eradicating the spreading of soil-borne pathogens that might have been left over from previous plants. A good idea is to prepare the ground the previous autumn or winter and add compost to enrich the soil. It's helpful for producing the best soil conditions for sweet corn to plant leguminous plants like beans and peas as a previous crop. This supplies nitrogen which sweet corn particularly like. When growing sweet corn, a suitable drainage system should be prepared. A water clogged soil will not help in the sweet corn's growth and will lead to a poor harvest. Grow your plants on slightly raised mounds if possible or make sure the garden bed has good drainage. A bit of history first: Sweet corn can be classified into two broad varieties — the open pollinated variety and the hybrid types. Though the origins of open pollinated sweet corn can't be specifically dated in history, what's known is that there were as many as 63 such varieties by the start of the 20th century. All of these are mutant varieties of field corn. Of these the Golden Bantam became hugely popular. The primary problem with open pollinated varieties, however, was the difficulty of storing them for a long period. As a result, many hybrid varieties were developed that are much easier to grow, yield better harvests, taste a whole lot sweeter and can be stored for longer periods. Kernels can either be bi-colored (a mix of white and yellow), white, or yellow — and color is no indication for sweetness. Depending on their variety sweet corn may mature in the early, mid or late season and are subject to the local weather conditions. The general belief is that ears produced in the mid and late seasons are of much better quality. Though the early varieties are lower in quality, they are popular simply because of their earliness. 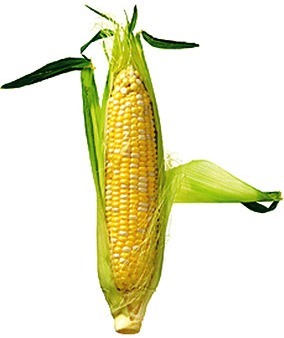 The most varied classification of sweet corn is based on the sweetness of the kernels. The four basic categories they are classified into are: standard (su), sugary enhanced (se), super sweet (sh2) and synergistic (sy). The standard (su) variety contains 6% sucrose, as opposed to the 4% sucrose content of field corn. The su-1 gene present in it is responsible for making it starchy. When growing sweet corn of this variety, it needs to be harvested on time and eaten soon after. The sugary enhanced (se) variety contains the 'se' gene which is responsible for enhancing the sugar content in this type of sweet corn. Both the 'se' and 'su-1' genes combine in this variety to result in a sweeter variety that doesn’t turn starchy as quickly as the standard variety. If stored in a refrigerator, they can retain their sweetness for two to four days and for this reason they are popular in local farmer markets. The super sweet (sh2) variety as the name indicates is the sweetest of all and contains the "sh-2" gene which raises the sucrose levels of the kernels 2-3 times that of the standard type. As a result they retain their sweetness much longer, making them ideal varieties for shipping. However, there are some significant disadvantages of this strain. The seeds used for planting are prone to cracking. To grow they require the soil temperature to be higher than 13°C (55°F) and they need to be planted at lesser depths than other varieties. They also call for isolated planting (a minimum 90m (300ft) distance needs to be maintained) as cross-pollination, if it occurs with a standard plant, can lead to starchy kernels in both yields. And, though the mature kernels are found to be sweeter they are less creamy compared to the other types. The synergistic (sy) type of sweet corn is a relatively new variety. It combines all the genes in such a manner that a single ear may contain a variety of kernels (Su, Se and Sh-2). The planting stage begins with the selection of the right seed variety depending on your soil temperature. Keep in mind when growing sweet corn that standard sweet corn (su) can be planted first, as early as you can, in soil that's about 10°C (50°F). The sugar enhanced (se) variety requires soil that is at least 17°C (63°F) or higher for germination. The same holds true for the super sweet (sh2) variety. To get the best results, plant your corn patch in a square configuration, or at least a double row. This is essential because sweet corn depends on the wind for pollination and this works best when cornstalks are close enough to touch each other. Plant extra seeds per block and if necessary you can use any spare seedling to fill in gaps so you won't have to worry about pollination. Since sweet corn grows best in soil that's rich in nitrogen and moisture, make sure you add adequate amounts of a manure-compost mixture to it. Seed spacing: If you're planting the seeds in soil that is cool and moist then it's wise with sweetcorn seeds to dip them in an organic treatment first to stop fungi, or buy treated seeds. Sow 1-2 seeds in a spot and then move 20-30cm (8-12") and plant the next lot. Create rows or blocks in this manner that are about 30-40cm (12-16") apart. The standard and sugar enhanced variety seeds need to be planted at a depth of 3-4cm (1-1½"). If you're planting the supersweet variety, however, make sure you do so at a depth of 2cm (¾") only. When the seedlings break the ground, go through your patch and check if more than one seedling has emerged from the same spot. If so, then gently pull out the one that appears weaker, or let them grow slightly bigger to transplant into any gaps you may notice. If you see the corn leaves curling, make sure you water immediately as that indicates a lack of water. It's always better to water the crop well every day or other day to prevent drying out. Depending on your climate, when your crop reaches a height of about 50 cm, you can slow down watering it — except of course on occasions when you see the leaves beginning to curl. Fertilize and check your growing sweet corn plants and keep any weed growth down at this stage. You'll soon find some tassel-like structures growing out of the top of all the plants; these are the male parts that contribute the pollen. The female parts are found on the silk threads that are attached to the kernels. Unless each silk thread receives pollen, the kernel it's attached to will not grow. Therefore, it's a good idea to wait for the pollen to ripen and if there's no wind, shake the plants a bit yourself. This will increase the success rate of the pollination process. When your corn cobs grow to a length of 20cm (8"), start checking to see if they are ready to be picked. You can tell whether or not they are ripe by looking at the color of the kernels which will be white with a hint of yellow. If a milky substance oozes out of the kernels when pricked, the corn cobs are ready to be harvested. To ensure that your crop stays naturally sweet for a longer period, immerse them in ice-cold water right after harvesting them. Cutworms can be extremely harmful; however due to their unpredictable nature they don't always actually cause damage the growing sweet corn. They are usually found amongst weeds. Any area which has poor drainage and remains wet most of the time allows weed to grow. These are breeding grounds for cutworms. Late planting and quantities of decaying vegetation can also encourage cutworm infestations. The best way to avoid cutworm infestation is to prepare the land early and regularly control the weed growth. If cutworms do appear, eradicating them quickly by using an organic spray should control their growth before any major damage occurs. This generally occurs if the soil is moist and cool. This problem can be avoided by improving the drainage system with compost and using raised beds or mounds. Another common problem is rust or leaf blight. This occurs in areas where it is warm and wet. This problem can be avoided by using an organic blight cure. These pests can cause the most serious damage to your sweet corn as they attack the main product. Once they establish themselves in the ear, to control them is next to impossible. These brown head moths lay their eggs in the corn silk. Once the egg hatches, the larvae feeds on the egg shell and then starts eating the silk and the ears. They usually start eating during the night and commonly only one caterpillar is found on one ear, as one can devour the other. Prevention methods should start when the silk ears are about 10% developed. An organic suffocating oil can be sprayed on the tips of the silk tube or pheromone traps also work effectively, when placed around the cornfield. These pests infest the leaf and stalk and deteriorate the stalks until they break. They are most destructive against corn that is planted early. They make holes in the leaf and stalk that allow pathogens to invade the plant and rot it. These pests should be treated before they start destroying the plant. Once European corn borers invade the plant, eradicating methods don't work so effectively. The best way to prevent these pests from occurring is to use the biological control of the parasitic wasp, Trichogramma. If a few plants show signs of infestation consider using an organic spray to control their growth. Also known as picnic beetles, these pests feast on over-ripe growing sweet corn and damaged corn. They usually feed on corn that has been spoiled by corn earworms, but can also infest unharmed ears. These brown to black beetles are not very easy to control. Even if you manage to destroy large numbers, more may appear from untreated locations. These tips on growing sweet corn may sound like a lot of work but they aren't. These are just some good basic rules to make sure you get the best out of your time and garden. Take good care of your sweet corn and it will take good care of you and help you harvest sweet benefits for delicious summertime treats. List of Vegetables — Check out more vegetables to grow.